Success Formula For Shy Entrepreneurs is a unique 4-module online success programme for shy and introverted people – yes, you can achieve your dreams without changing your personality! 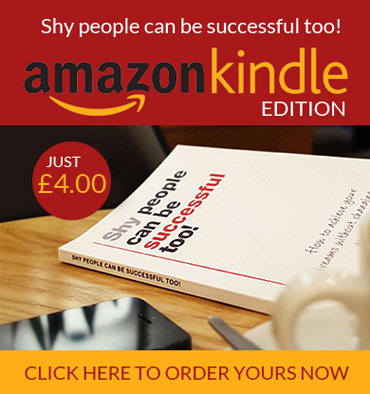 Success Formula For Shy Entrepreneurs is a unique 4-module success programme for shy and introverted people – yes, you can achieve your dreams without changing your personality! I’ve put everything I’ve learned into a straightforward yet powerful online programme to lead you through transforming your life in weeks rather than years. Confidence – Discover simple tools and techniques to boost your confidence. Communication – become an excellent communicator so that all your business dealings can be enjoyable rather than causing you to break out in a cold sweat! Calling – find your calling, what is it that energises you every time you do it (rather than forcing yourself to do something that doesn’t suit your personality). Consciousness – discover the power of changing your mindset. I will provide you with the tools to help you do it.